The findings indicate the presence of genetic material left behind by the species, such as scales, excrement or mucous, but not the establishment of Asian carp in Lake Erie. Positive eDNA tests are regarded by the scientific community as an indicator of the species’ recent presence, however, positive results can occur whether the organism was alive or dead. A video demonstrating how to identify bighead and silver carp can be viewed on the USFWS YouTube channel at http://youtu.be/B49OWrCRs38. Identification guides, frequently asked questions, management plans and an online reporting form are available online at www.michigan.gov/asiancarp and www.wildohio.com, or call 800-WILDLIFE. The Michigan and Ohio Departments of Natural Resources are committed to the conservation, protection, management, use and enjoyment of the region’s natural and cultural resources for current and future generations. 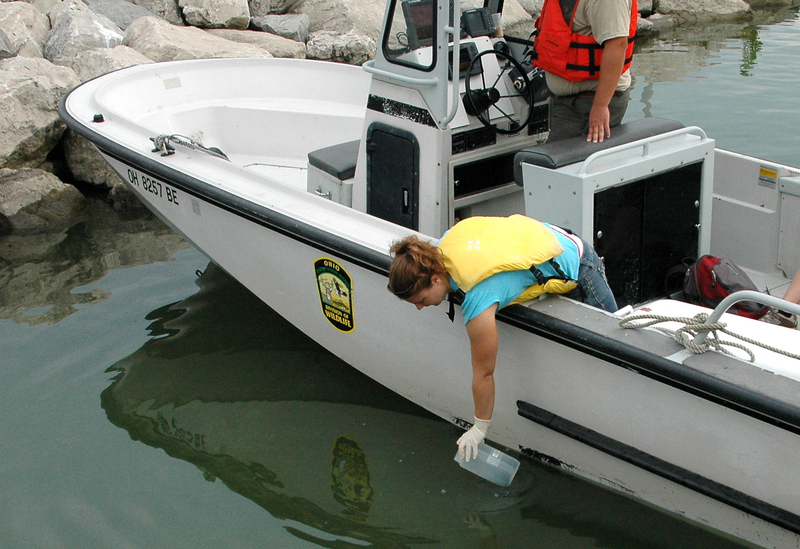 Photo caption: Michelle Budny from the University of Notre Dame collects a water sample from Lake Erie for eDNA screening. Photo credit: Lindsay Chadderton, The Nature Conservancy. Map information: Locations of Lake Erie water sample sites, with Asian carp eDNA positive locations marked in red (bighead carp) and orange (silver carp). Map credit: Sagar Mysorekar, The Nature Conservancy.